If you need a Volant Replacement filter, you've come to the right place. Volant Replacement Filter 5150 features Volant's high performance 5 layer (4 cotton gauze / 1 Synthetic) media. Volant Replacement Air Filters are made of the highest quality textiles, pleated between a top and bottom aluminum screen. Each Volant filter comes pre-oiled and ready for use. This design will allow the highest air flow rate possible and a very long filter life. 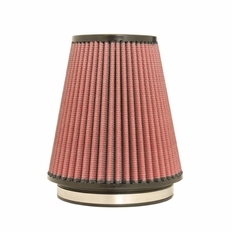 We recommend cleaning the Volant air filter only when very dirty or 12,000 miles. This item is intended to replace a filter in a Volant Air Intake System. These filters are NOT for Factory Air Intakes, only Volant Intake Systems. If you have any trouble determining which Volant Air Filter you need, please give us a call.